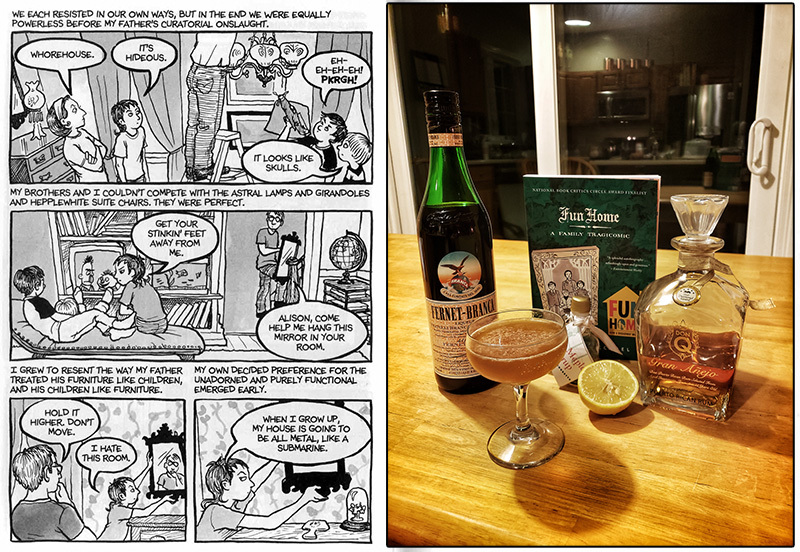 I wasn’t sure I had a fourth Fun Home cocktail in me. For a while I had been playing with a Paper Plane/Aviation hybrid to riff on the “I wanna play airplane” lyric, but that didn’t pan out (mostly because I’m not that crazy for either of those cocktails anyway). There was nothing else really thematic that was striking me. But it was the last week of the show and I knew I wanted to do something. I was very close to taking one of my pre-existing unnamed drinks and giving it a Fun Home title, something I’ve really tried to avoid here up till now. Stir with ice and strain into a Nick and Nora (why not?). The St. George offers a nice bitter coffee taste, so that, along with the mole bitters, counters the chocolate nicely. The cherry in Leopold Bros. is especially tart, compared to, say, Cherry Heering, so that adds some needed brightness. And these ingredients just screamed tequila/mezcal to me. It might not fit a theme, and the name might not be evocative of the ingredients, but it’s sure tasty. Sometimes I should just worry about making a good drink. This was a tough one. The joke of the title (the song in Fun Home is “Changing My Major to Joan”) was one that was told me before the show was even fully cast, and I knew I wanted to do something with it. But beyond it containing gin what should the cocktail be? 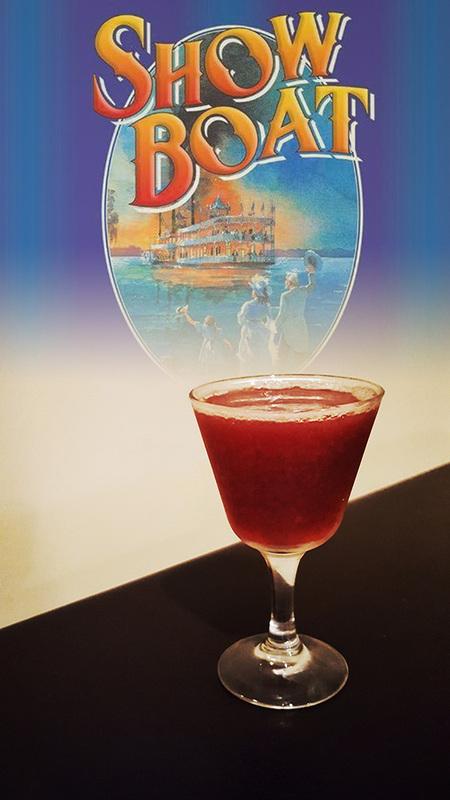 The song doesn’t really give any hints like the House On Maple Avenue did, and I wasn’t sure I just wanted to do a generic gin drink with no theme. 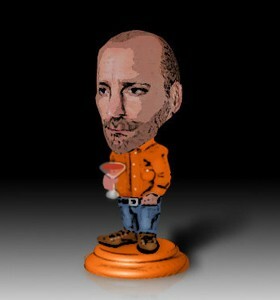 I thought perhaps I could take a popular drink with another base spirit and swap in gin (Changing Mojito to Gin, perhaps?) 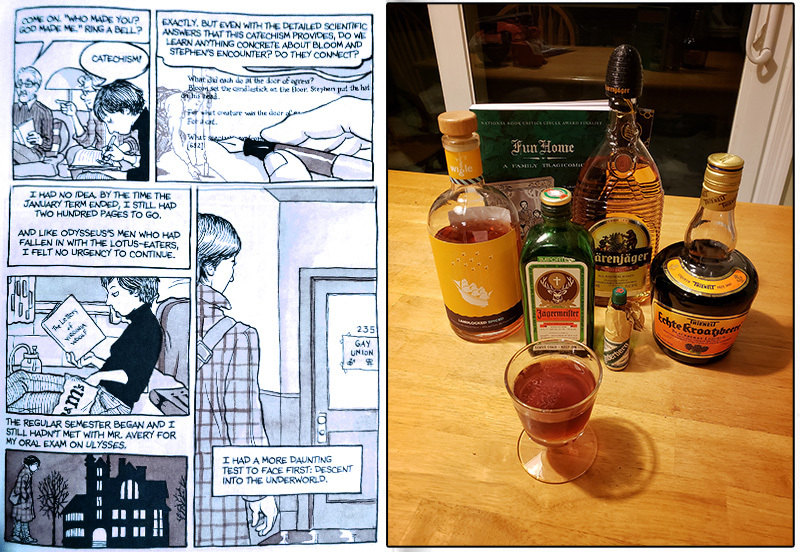 but swapping in gin (or another spirit) is fairly common and though I tried some Manhattan variations that stayed closer to a Manhattan than a Martinez nothing really took off. 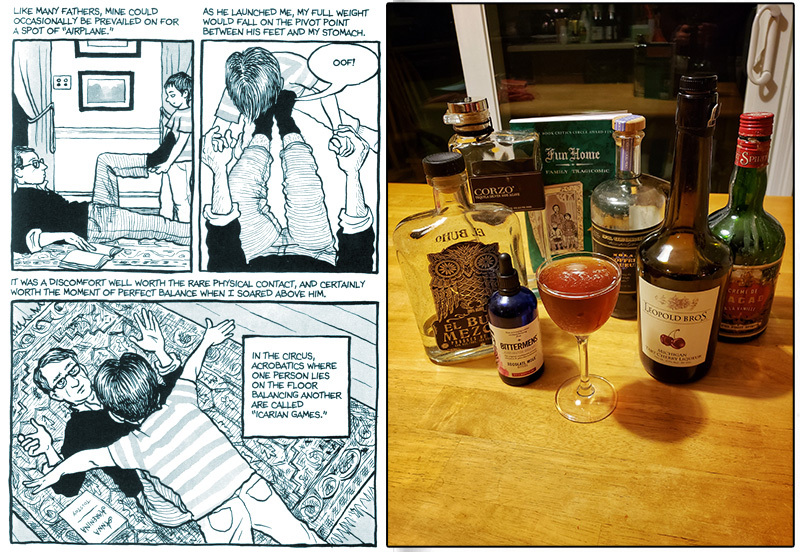 I also tried to do a mixture of gins — adding in an barrel-rested gin with a London Dry, then some Damson Gin liqueur or Sloe Gin for sweetness — but this wasn’t successful. That’s when I turned to a gin cocktail I had previously developed but had yet to name or feature. In itself it is tasty but nothing out of the ordinary. 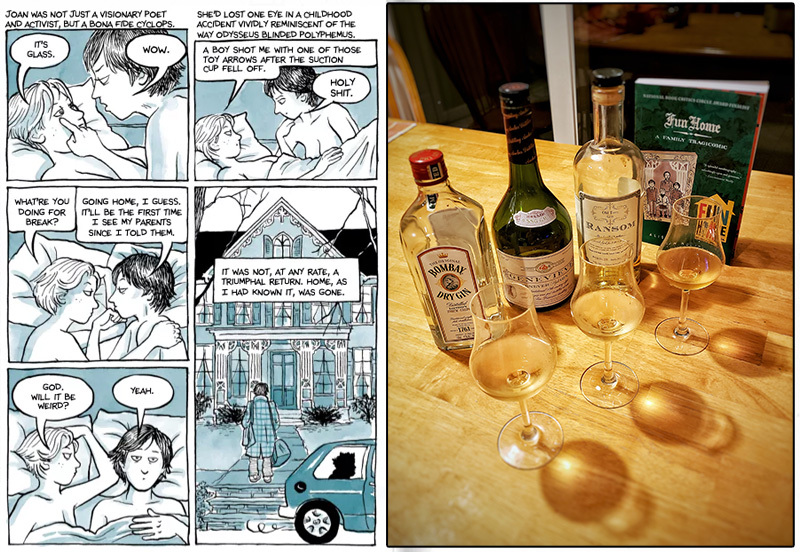 I just really wanted to use Pamplemousse Rose, a wonderful and delicate grapefruit liqueur. But what attracted me to it was the fact that there was an ounce and a half of gin with three other ingredients that were simply stirred, not shaken. Because of that, I thought it would be interesting to mix up the other ingredients, without ice, and then split the mixture into thirds. 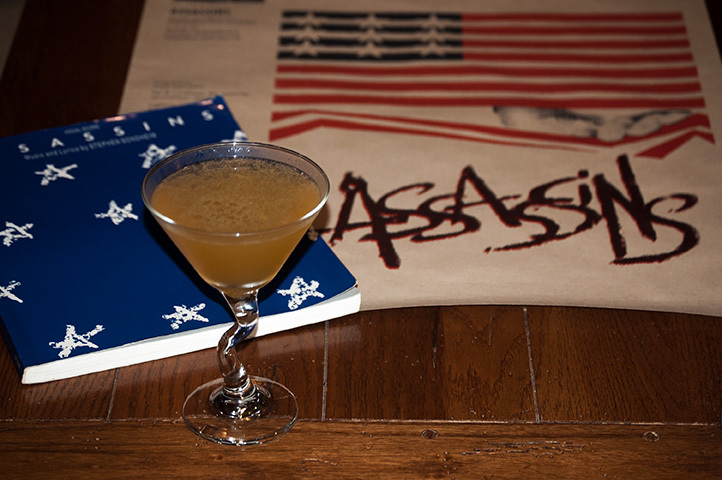 I could then mix a half ounce of gin with each and have a single cocktail flight — or study, hey! — where the same flavors could be tested against three different gins. You could do it with three London Drys, or three New Western, or one each from several categories, which is what I chose to do in the end, splitting the cocktail into one London Dry, one Genever-style and one Old Tom. I found it worked with each. Stir with ice and strain into coupe. Alternatively, mix all ingredients but the gin without ice. Split this into thirds. Pour 0.5 oz. of gin into each third, stir with ice and strain into separate glasses. Class dismissed! 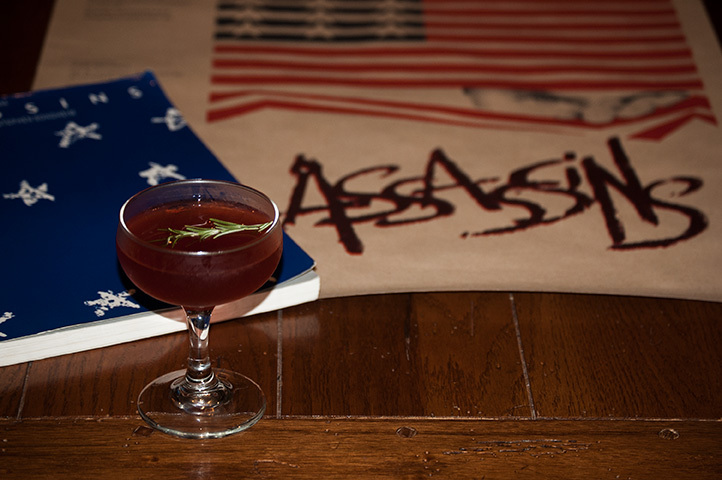 Assassins cocktail #8, after Sara Jane Moore, attempted assassin of President Gerald Ford. A Ford cocktail variation, with Old Monk rum substituted for the Old Tom gin providing a somewhat misplaced funkiness, and also making it, fittingly, a cousin of the El Presidente. 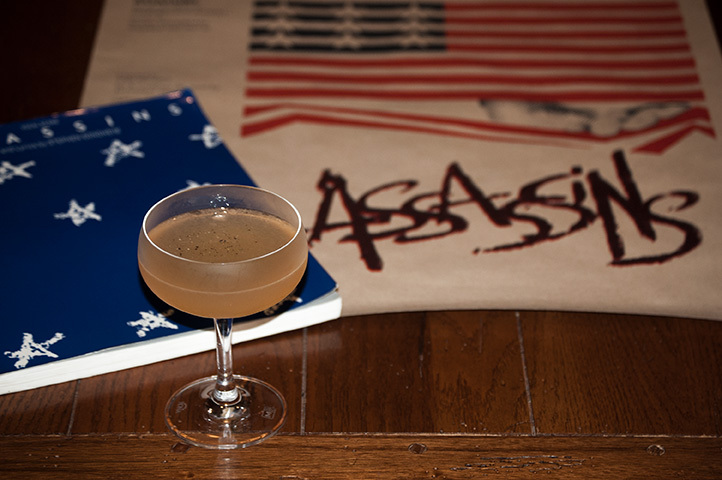 Assassins cocktail #6, after Sam Byck, attempted assassin of President Richard Nixon. This Bud’s for you, in a spicier, bitter Boilermaker. Shake with ice and pour into old fashioned glass. Grate fresh ginger on top. 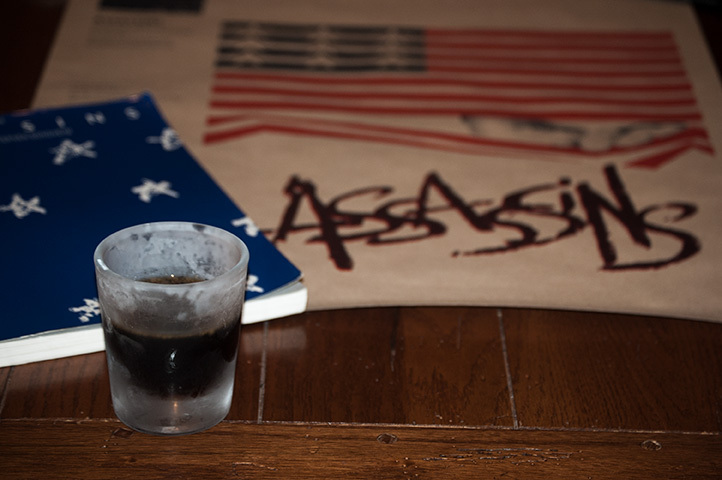 Assassins cocktail #5, after Lee Harvey Oswald, assassin of President John F. Kennedy. 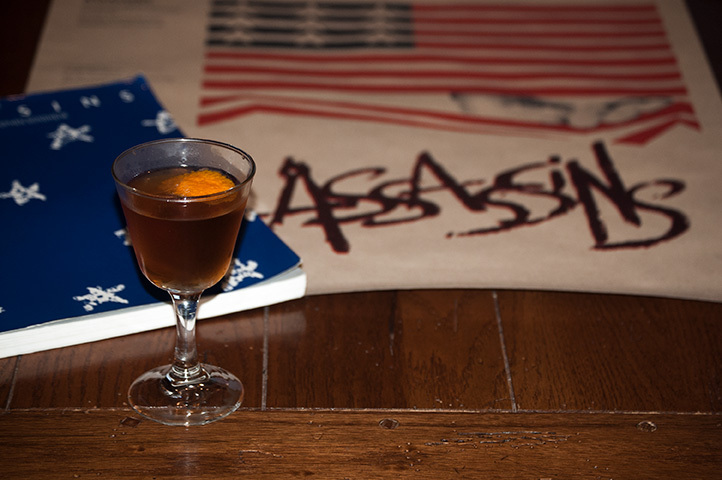 What starts as a New Orleans Sazerac gets twisted with Russian vodka over American apple pie.